Welcome to the Holy Women, Holy Men blog! We invite you to read about this commemoration, use the collect and lessons in prayer, whether individually or in corporate worship, then tell us what you think. For more information about this project, click here. Richard Meux Benson and Charles Gore are remembered for their role in the revival of Anglican monasticism in the nineteenth century. Richard Meux Benson, the principal founder of the Society of Saint John the Evangelist, was born on July 6, 1824, in London. As a student at Christ Church, Oxford, he came under the influence of Edward Bouverie Pusey, who became his spiritual mentor and lifelong friend. In 1849 Benson was ordained a priest and became rector of Cowley, a village neighboring Oxford. In 1866, together with two other priests, he founded the Society of Saint John the Evangelist (SSJE), “a smallbody to realize and intensify the gifts and energies belonging to the whole Church.” SSJE became the first stable religious communityfor men in the Anglican Church since the Reformation, styled as a missionary order patterned on St. Vincent de Paul’s Company of Mission Priests. A branch house was established in Boston in 1870. In 1874 work began in Bombay, and later Poona. By 1880 SSJE had opened a mission house in Cape Town, South Africa, and in 1903 in the Transkei. Benson wrote the original SSJE Rule and served as Superior until 1890. Charles Gore was born in 1853 in Wimbledon and educated mainly at Oxford. He was ordained in 1876 and served in positions at Cuddeston and Pusey House, Oxford, both of which were focused upon theological education and the formation of clergy. While at Pusey House, Gore founded the Community of the Resurrection, a community for men that sought to combine the rich traditions of the religious life with a lively concern for the demands of ministry in the modern world. Gore, a prolific writer, was a principal progenitor of liberal Anglo-Catholicism in late nineteenth and early twentieth century Anglicanism. He was concerned to make available to the church the critical scholarship of the age, particularly with respect to the Bible. A second but no less important concern was to prick the conscience of the church and plead for its engagement in the work of social justice for all. Between 1902 and 1919, Gore served successively as bishop of the dioceses of Worcester, Birmingham, and Oxford. I Gracious God, who hast inspired a rich variety of ministries in thy Church: We offer thanks for Richard Meux Benson and Charles Gore, instruments in the revival of Anglican monasticism. Grant that we, following their example, may call for perennial renewal in thy Church through conscious union with Christ, witnessing to the social justice that is a mark of the reign of our Savior Jesus, who is the light of the world; and who liveth and reigneth with thee and the Holy Spirit, one God, for ever and ever. Amen. II Gracious God, you have inspired a rich variety of ministries in your Church: We give you thanks for Richard Meux Benson and Charles Gore, instruments in the revival of Anglican monasticism. Grant that we, following their example, may call for perennial renewal in your Church through conscious union with Christ, witnessing to the social justice that is a mark of the reign of our Savior Jesus, who is the light of the world; and who lives and reigns with you and the Holy Spirit, one God, for ever and ever. Amen. Text from Holy, Women, Holy Men: Celebrating the Saints © 2010 by The Church Pension Fund. Used by permission. We invite your reflections about this commemoration and its suitability for the official calendar and worship of The Episcopal Church. How did this person’s life witness to the Gospel? How does this person inspire us in Christian life today? If you’d like to participate in the official online trial use survey, click here. For more information about the survey, click here. To post a comment, your first and last name and email address are required. Your name will be published; your email address will not. The first time you post, a moderator will need to approve your submission; after that, your comments will appear instantly. Title. This is confusing: ‘Religious, 1915 Bishop of Worcester, of Birmingham, and of Oxford, 1932’ What belongs with which man? 1932 appears to be down a ½ line in the printed edition, too. Hebrew reading: This is quite a dramatic 4 verse pericope from 1 Kings; but does it fit these holy men? Bio. Both lack ‘He died in ….’ statements. 5th paragraph: ‘… a principal progenitor of liberal Anglo-Catholicism …’ Progenitor is a great word but I cannot remember its use anywhere else in Holy Women, Holy Men. Again, ‘… to prick the conscience of the church …’ It seems an odd choice of words for Holy Women, Holy Men. I’m just sayin’. Poona? the Transkei? The former I assume is in India and the latter in Africa, but do they have more familiar names now? And if I’m alone in my ignorance, then let them stand. 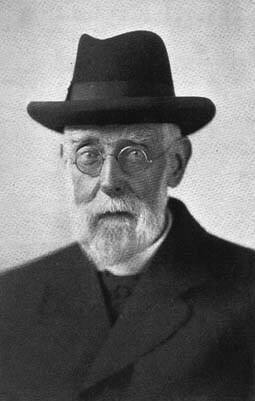 Charles Gore, Theologian, and Bishop of Worcester, of Birmingham, and of Oxford, 1932. Benson was a Pastor, as well as the Founder of Cowley Fathers. I never realized Gore was a bishop. I always associated him with his theological impact. Shouldn’t these facts be acknowledged in the titles? THE BIOGRAPHY: It seems negligent merely to say, “[they] are remembered for their role in the revival of Anglican monasticism….” We’re remembering them in HWHM because they (presumably) led holy lives. Monasticism isn’t Holy Baptism; it doesn’t define Christian Life. Neither is it an ideal to which all should aspire. It can be a legitimate expression of Baptismal Life in Christ given the individual’s gifts and calling, but if scoundrels or misfits helped revive Anglican monasticism (and scoundrels or misfits have abounded in the history of monasticism) they wouldn’t belong in HWHM. Beyond this, each of these individuals gets only two paragraphs before the page is full. In each case details of the “resume” hijack coverage of the person. I ended up more informed about the foreign locations of SSJE than about Benson. That’s probably attributable to monasticism’s being made the focus throughout the commemoration rather than the Holy Men’s holy lives. It should be otherwise. In Gore’s case generalizations abound but no sense of the CONTENT of the generalizations is supplied (e.g., WHAT demands of ministry cried out for monasticism? ; WHICH aspects of Anglo-Catholicism were the “liberal” ones? ; “critical scholarship” about WHAT? ; WHICH social justice matters? ; was he a GOOD bishop in his dioceses?) Lux Mundi is never mentioned. (He and it receive excellent comment in the New Church’s Teaching Series, in the volume – if I remember correctly – The Christian Social Witness, by Harold Lewis.) In this commemoration we hear nothing about it. All of this can’t be addressed, and it must of necessity be brief, but some such content seems called for. Second paragraph: why the word “stable”? Because SSJE endured? If so, it seems anachronistic to say he founded “the first stable religious community for men” because what he founded couldn’t be known as “stable” at the time of its founding. (Surely, it’s not called “stable” because others were “unbalanced”?) I think we should lose the word “stable” here. “a principal progenitor “ – Progenitor, as a word choice here, may be a difficult choice to live with. An online dictionary gives a definition as “a person or thing that first indicates a direction, originates something, or serves as a model; predecessor; precursor: the progenitor of modern painting.” This paragraph could well begin with its present second sentence (substituting “Gore” for “He”) and doing away with the whole “progenitor” sentence. THE COLLECT: I like the thanksgiving in the collect. As for the invocation, see below. I have strong reservations about the petition and the virtual “so that” clause, but since the latter doesn’t flow from the petition anyway, it doesn’t make sense to say much about that. Restricting the thanksgiving to monastic work misses the larger whole and contributes to a dwarfed commemoration of both Benson and Gore. “That we may call for perennial renewal of your Church” seems odd, first, because it doesn’t ask that we (individually or corporately) may be actually renewed, just that we may CALL for it — like room service(?) On whom should we call? (Somebody in general, maybe even God?) Secondly, I’m startled that the renewal be specifically through “conscious union with Christ,” as opposed to something less mental and more holistic, such as a total dedication of mind, body and soul. (A narcoleptic once asked me if he could be a good Christian only when awake; there is something to be said for disciplines, actions, character formation, belonging as part of and participating in the believing body, and developing relationships that aren’t restricted to “conscious” processes per se.) Even the word “perennial” puts an intellectualized cast to the collect (especially when combined with monasticism, conscious union, and abstract social justice). Having “light of the world” in the closing doesn’t make up for overlooking “Lux Mundi” in the biography, but it could help remedy the invocation, especially if it were mentioned in Gore’s biography. I found this collect unsuitable for the whole church’s use. THE READINGS: All are good choices, important passages, and in keeping with the lives of both men. I’d also echo John’s points, especially regarding the petition in the collect. I’d also add that if we are to say ‘amen’ to the thanksgiving, ‘We offer thanks for… instruments in the revival of Anglican monasticism’, it needs to be explained why the revival of Anglican monasticism is not just a good thing for those whose churchmanship runs in that direction, but for the whole church. Clicked on the comments to mention that I thought the biographies should focus more on the two men (whom I admire and find quite appropriate for the book), but John said everything I’d thought of and more! Combining their celebration is a Wonderful idea. In view of the new rule that more than one commemoration can be held on the same day, why not move this commemoration to 1/14 or 1/17? The subtitle is lengthy, perhaps confusing, and emphasizes ecclesiastical rank, rather than the reason these Holy Men are to be honored. I suggest simply “Revivers of Anglican Monasticism”. That done, delete the redundant first paragraph. Line 9, third paragraph: add “India, beginning with Bombay (now Mumbai)” after “in”. How many American readers will have heard of “Poona”? Line 10, third paragraph: substitute “its first South African Mission House in Cape Town, and in 1903, a second in the Transkei (now part of the Eastern Cape)” for all the rest of the sentence after “opened”. This explains where in the world Transkei is, and also that the SSJE had a presence in what is now the Republic of South Africa. Line 11, third paragraph: move the final sentence up to follow “Priests” in line 8. Unless Benson went to Transkei to write the Rule, long after his term as Superior ended! Line 1, fourth paragraph: add “, south of London,” after “Wimbledon”. Line 1, fourth paragraph: substitute “at Harrow and Balliol College” for the dubious “mainly at”. Line 3, fourth paragraph: correct spelling to “Cuddesdon”. Line 6, fourth paragraph: substitute “; it” for “that”. It is the community (not the men) who sought the combination. Add a new paragraph: “Benson died on January 14, 1915, in England.” “Gore died in London, January 17, 1932”. The Standing Commission on Liturgy and Music has created this site to invite feedback about some of our current projects. We hope that this conversation will be a way to renew and enliven a shared vision of the church’s mission in the world. To post a comment, your first and last name and email address are required. Your name will be published; your email address will not. The first time you post, a moderator will need to approve your submission; after that, your comments will appear instantly. Our rules for posting are fairly simple. Express yourself with courtesy, civility, and respect for others, whether or not you agree with them.